Check out our new range of high quality spout pouches! Currently available in clear, white and gold colours. Printed and custom size bespoke pouches also available, please get in touch for more details. The spout pouch is one of the more popular types of flexible packaging, especially in the food and drink industry. Maufacturers can benefit from this extremely versatile and customisable alternative to other types of plastic packaging, such as tubs and bottles. 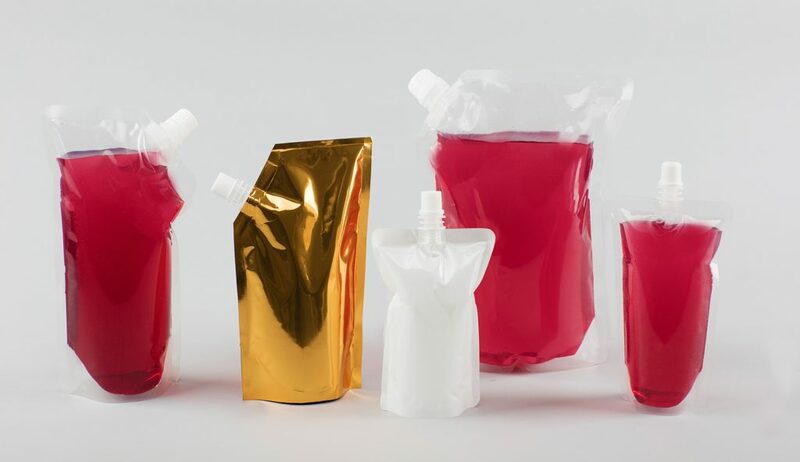 Regardless of whether you specialise in energy drinks, cocktails, baby food or even car wash, spout pouch packaging is the innovative liquid packaging solution you’ve been looking for. What are the uses of spout pouches? Juice drinks are, unsurprisingly, at the top of the list of products stored in a spout pouch. However, spout pouches are being increasingly relied on by food manufacturers for packaging children’s food for example, including vegetable puree and juices, because spouts provide the perfect balance between preventing spillage during use and allowing ease of filling. What’s more, spout packaging is the ideal solution for the storage of food products for which remaining fresher for longer is a key priority such as soup, cocktail mixes and frozen foods. However, the applications of spout pouch packaging are not solely limited to the food and drink industry. Spout packaging is also becoming more and more popular as a packaging alternative for cosmetic products such as face masks, as well as various home cleaning products and detergents. What are the benefits of spout packaging? Amongst the many benefits of spout packaging is the excellent evacuation they provide – you can minimise food waste by using up to 99.5% of the product if you store it in a spout pouch. Spout pouches are also great for consumers on the move, as they are both easier to access and to carry. When it comes down to flexible packaging, spout bags are the most economical and eco-friendly option – their production uses up less natural resource than that of the more traditional food packaging options. Spout pouches are also perfect for sample packaging, as they offer the perfect size and functiona versatility for distributing pastes or liquid samples. Moreover, you can make sure your products stand out in a busy retail environment by customising your spout bags with high-quality prints.